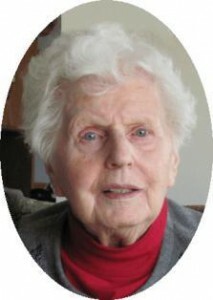 Sophia A. Bostwick, 93, of West Michigan Street, Port Washington passed away peacefully on Saturday, June 16, 2012 at Aurora Medical Center in Grafton. She inspired many through her love of family, nature and living a simple, fulfilling life. She enjoyed sharing with others the bounties of her gardens and delicious home cooking. She loved laughing and social times with neighbors and friends. Sophie was born on April 12, 1919 in Millston, WI to Frank and Mary Jerse Novak. She was raised on a farm along with six sisters and three brothers. Later the family farmed in Grafton. In her youth she had waitressed at the former Mayer Hotel in Port Washington. On November 11, 1944, she married Howard B. Bostwick of Port Washington at St. Marys Catholic Church in Port Washington. They raised seven children instilling in each the values of education, hard work, care of the environment and empathy for others. Sophie was a proud and loving wife, mother and grandmother. She was preceded in death by her husband Howard on March 22, 2003 and her son Edward. She is survived by her children Nova (Gary) Mijal of Prairie de Sac, Beth McQuade of Chatham, Illinois, Mary Ann Bostwick of Brisbane, California, Allon Bostwick of Fond du Lac, Dennis (Janet Sperger) Bostwick of Beaver Dam and Scott (Joan) Bostwick of Whitefish Bay and daughter-in-law Mary Bostwick of Wauwatosa. Further survived by 17 grandchildren, five great-grandchildren, sister-in-law Leona Lee Bostwick of Deerfield, Wisconsin, brother-in-law John Torke of Port Washington and Cousin Mitzi OBert of Carlsbad, California, other relatives and friends. She leaves behind many endearing relatives and friends. Mass of Christian Burial will be celebrated at 2PM Friday, June 22, 2012 at St. Marys Catholic Church, Port Washington. Reverend Thomas Lijewski will be the celebrant. Visitation Noon-2PM Friday AT CHURCH. Interment in St. Marys Cemetery, Port Washington. Memorials to the Port Washington Historical Society, PO Box 491, Port Washington or the Judge Eghart House Museum, PO Box 87, Port Washington are appreciated. The family thanks the staff of the Port Washington Harbor Club and Aurora Medical Center Grafton for their loving kindness and quality care. The family also thanks Aurora Hospice for their support.